Port of Plymouth 1572, Captains, on the way for 3 trips in search of fortune and glory! 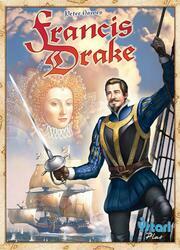 The players will try to imitate Francis Drake's exploits by making 3 trips to the Caribbean Sea. Before leaving England and the port of Plymouth, they will have to find the necessary crew, guns, boats and supplies. Once ready to sail, each captain will have to plot his course on the Caribbean Sea!